This archive holds all posts form November 28, 2016. Trump’s election has unleashed a flood of animus against Mexican Americans. Within 24 hours of the election, Mexican-Americans across the nation (along with many other racial, ethnic, religious, and LGBTQ groups) were being verbally and even physically attacked. I personally heard several first-hand accounts. A novelist friend of mine tweeted a criticism of Trump and a stranger threatened him with deportation. Similarly sad, demeaning and outright terrifying stories are erupting all over social media and archived by groups including the Southern Poverty Law Center. What we are seeing is the reanimation of longstanding stereotypes—what I call “racial scripts”—that present Mexicans as unassimilable, criminal, even diseased. We like to describe ourselves as a melting pot nation, based on the idea that immigrants can learn our language, appreciate our culture, and adopt our values and ultimately “become” American by way of assimilation. This had been the case for white ethnic immigrants before, even those who faced much discrimination, such as the Irish, Italians, and Jews. But Mexicans have had citizenship available to them for nearly 170 years, since the Mexican-American War ended. So why aren’t they seen as fully assimilated into US culture? Why can Donald Trump still call them “bad hombres,” rapists, criminals, drug dealers, and disease carriers? Presumably much of this animus derives from concerns about the undocumented. The Pew Foundation estimates that there are over 11.2 million undocumented immigrants in the U.S. of whom Mexicans comprise about 53 percent. But we can’t characterize all immigrants as lawless marauders simply because they’re undocumented. Those with criminal records are already being deported. Some of President Obama’s critics call him “the Deporter in Chief” because he’s already deported 3 million immigrants—more than any other president before him. Many take the position that being undocumented alone qualifies migrants as criminals—they are “illegal.” But being undocumented is also part of our country’s history. European immigrants who came to the US in the 19th and early 20th centuries faced few immigration restrictions. And even when these restrictions were violated, relatively short statutes of limitation limited the power of deportation. When these laws did change in 1924, the federal government instituted a variety of mechanisms to help make mainly European immigrants “legal,” including suspending deportations and allowing immigrants to pay a small fee to register when they arrived in the United States, providing them access to measures that would ensure their assimilation, while not making these accessible to Mexicans. Mexican immigrants enjoyed no such opportunities. Instead, they faced increasing regulation through the Border Patrol, established in 1924. Health screenings at the border used race, not symptoms, as the organizing principle. Other forms of control worked outside the law. Like African Americans, thousands of Mexicans were the victims of lynch mobs well into the 1900s, a legacy documented in community and archival records. 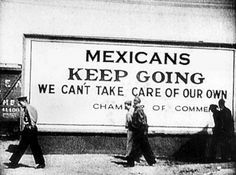 During the Great Depression, when Mexican labor was no longer needed, U.S. repatriation practices sent an estimated one million Mexicans back to Mexico, including some U.S. citizens of Mexican descent. All these practices led to ways of seeing and categorizing Mexicans that reduced them to a type—creating “racial scripts” that characterized Mexicans as “illegal” and diseased. These scripts persisted even as Mexican-Americans became a permanent and visible part of U.S. society. After the mid-1940s, Mexican-Americans’ second generation numbers eclipsed those of the immigrant generation. Yet, American citizens of Mexican descent were segregated from mainstream America. They could not freely choose where to live because of racial covenants and discriminatory government lending practices that shunted them into segregated neighborhoods. Children attended “Mexican” schools and were only allowed to swim in public pools the day before the pool was drained. They sat in the segregated section of movie theaters, were not allowed into many restaurants (along with “negroes” and dogs), and were buried in segregated cemeteries—a practice that extended even to veterans. Even if as individuals we could succeed in willing ourselves to not see race, or at least to not act on our perceptions, the long reach of past racism in areas such as government lending, private real estate practices, zoning regulations, unequal access to healthcare, and disproportionate exposure to toxic environments is now institutionalized. This kind of structurally embedded racism affects nearly every aspect of our everyday lives, advantaging some of us and disadvantaging others with respect to how and where we live, work, learn, and play, as well as positively or negatively affecting our ability to accrue assets, manage our health, and sustain a good quality of life. Once these racial scripts are in place, they are extended to all Mexicans, regardless of citizenship status, generations in the United States, educational level, income, language ability or even skin color. One only has to remember when Trump derided US District Judge Gonzalo Curiel who presided over the Trump University class action lawsuit, as unable to be biased because, as a Mexican, the judge had an “inherent conflict of interest” given Trump was “building a wall” along the US-Mexico border, never mind that the judge was born in Indiana. These scripts filter down to all of us, until someone can “joke” that my fourth-generation American son doesn’t deserve to carry American flag decorated gear. We would all agree that right thoughts lead to right words lead to right action. We must ask ourselves what scripts we are acting out and what they will lead to, regardless of our intent. ~Natalia Molina is Associate Dean, Division of Arts & Humanities, and Professor of History and Urban Studies at the University of California, San Diego. Professor Molina’s work lies at the intersections of race, gender, culture, and citizenship. She is the author of award-winning books, How Race Is Made in America: Immigration, Citizenship, and the Historical Power of Racial Script and Fit to be Citizens? Public Health and Race in Los Angeles, 1879-1939, both published by the University of California Press.